CHRISTEL BÜCHE - EUROLAB e.V. She has a degree in Social Work and is a Dance Therapist (BTD). She is educated in Modern Dance and is a Certified Movement Analyst (CMA) since 1993. She holds a certificate in Kestenberg Movement Profile (KMP) and has completed a Yoga teacher training. She works as a dance- and movement teacher in various contexts. She is very interested in teaching the concepts of LBMS to other movement professionals to broaden their understanding of movement and dance. She is a faculty member of the EUROLAB Certificate Program since 1999 and in the Dance Therapy training at the Tanztherapie Zentrum Berlin since 2000. 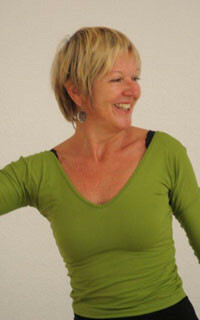 She has also taught LBMS in the Master Degree Program in Dance Therapy at the University in Heidelberg. Besides these contexts of further education, she also teaches movement and dance classes to different clientele like seniors or mentally ill people. Her focus is to enable the participants to have more expressiveness and being alive.